DIRT BAG BOOKCLUB: Noah Adams' Far Appalachia | DBP MAGAZINE ONLINE The World's Best Free Whitewater Publication. I spent some time on the last day of summer sitting at the put in to the Skykomish River here in Washington, enjoying the remote beauty and pausing to recollect. My heart was three thousand miles away… after all, it’s September, also known as Gauley Season. 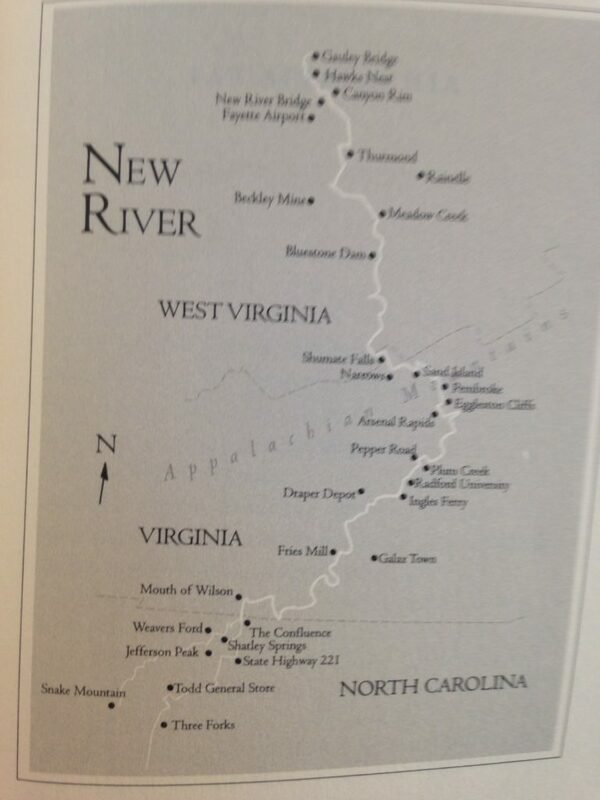 While waiting to start, my mind drifted east, thinking about my friends and the rivers of West By God Virginia… so I picked up Noah Adams’ book FAR APPALACHIA ~ Following the New River North and returned for an hour. Mr. Adams, host of NPR’s All Things Considered, although not truly a Dirt Bag himself, is a longtime river aficionado whose family roots stretch high into the mountains of Appalachia. We head downstream with him from the headwaters of the New River on the slopes of Snake Mountain in North Carolina, meeting the paddlers along the way that progressively guide him down more difficult sections of this classic river on its way to the confluence with the Gauley River in West Virginia. In these characters, true Dirt Bags in every sense, I see reflections of my friends and for that reason I highly recommend this book. Written in 2001, it takes us back in time to an era that has since closed, or at least morphed into the super-adventure conglomerates that now dominate the lower river. If you’ve lived this life, or ever tried to convey to family members who’ve never grasped the appeal of paddling exactly what IT is that fulfills us, Adams’ book will help put into words those fleeting images and feelings for you to revel in or share. 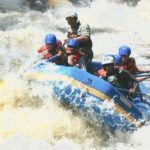 For instance, we get to read a rafting trip safety talk from the customer’s perspective [page 184]. …Scott takes up a position at the front of the bus. He’s in charge of both boats. He faces us with a stern look. “Everybody got a helmet? They’re all one size, you adjust them with that strap in the back, like a baseball cap. The rule is: Helmets on at all times in Whitewater. When we get on flat water and we’re floating and it’s hot, we can take them off for a while. The blue vests had been waiting on the bus seats when we got on. Their professional grade, with a wide flap above the shoulders, designed to hold your head up out of the water. Scott looks carefully from face to face. We all try out the proper hand position, now more afraid of hitting Scott than a falling out. He introduces us to some of the original dirt Bags who started rafting many years ago [page 201]. Fayette station rapids waits just below the original bridge. It’s our last run of the day and we move through it nicely, bouncing in some big holes. It’s deceptive — doesn’t look scary. But a champion high school swimmer dropped off the bridge one day, without a lifevest, and drowned. The wave action is so strong you just can’t fight your way back up from the bottom. And for those of us who remember the good ole days at Class VI… there’s this lasting image [page 205]. This is the end of season staff party at Class VI. A cool Sunday night with an early October three-quarter moon. You’d be comfortable in shorts and sandals, but with socks and a pull over. The river people are tanned, tired, smiling. The band kicks off “Rikki Don’t Lose That Number,” and the people laughing are the ones who heard it when it was new. The Class VI staff now has twenty years together, and many of them have been around since the start. They grin and hug each other and dance close for a night, barefoot and wearing tight jeans. There are mothers and dads holding babies, and three-year-olds running around.